1 Cover potatoes with water in 4-quart saucepot. Bring to a boil over high heat. Reduce heat to low and simmer 10 minutes or until potatoes are tender; drain and cool slightly. 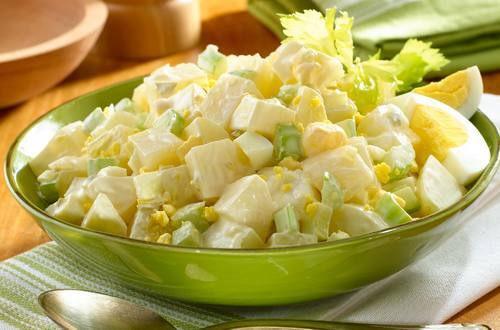 2 Combine Hellmann's® or Best Foods® Real Mayonnaise, vinegar and pepper in large bowl. Add remaining ingredients; toss well. Also terrific with Hellmann’s® or Best Foods® Canola Cholesterol Free Mayonnaise or Hellmann's® or Best Foods® Low Fat Mayonnaise Dressing.